According to the National House Building Council (NHBC), more than 26,142 new homes were registered to be built in the South East last year, on par with 2016 levels of 26,147 dwellings. Great news when you consider it is still one of the highest number of new builds in the region since the pre-recession levels of the Credit Crunch and the uncertainty of Brexit and the General Election. So, when a landlord recently asked me why the brand-new property she was considering buying was a lot more expensive compared to a second-hand/existing property of similar type, accommodation, location and structure I thought this would make a fascinating topic to do some homework on … homework I want to share with the homeowners and landlords of Aylesbury. You might believe that the difference between purchasing a new build home against purchasing a second-hand/existing home is just individual preference. Some buyers/tenants like the ostentatious trendy modern feel of a new home, whilst others like a home that has stood the test of time. So, what is the right answer? 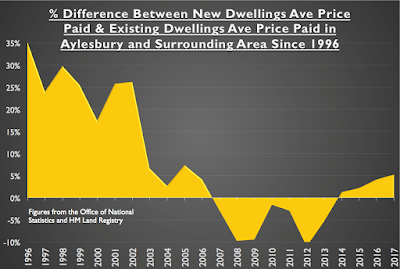 Well, I am going to be looking at some statistics that show there is a real difference in the Aylesbury and Aylesbury Vale District Council area’s property market when in to comes to new vs existing homes and the price paid. Looking at the average price paid for existing (second-hand) versus a brand new home since 1996, you can see from the graph it makes interesting reading. Yet possibly nothing is ever that easy, as there are issues with these statistics. The overall average for the whole Aylesbury Vale District Council area for the ‘new build premium’ (new build premium being the additional price a buyer pays for buying a new property compared to a second-hand one) over the last 21 years has been 7.9%. These statistics actually show that it is problematic to compare like with like because it is impossible to completely separate all the different factors of type, accommodation, location and structure etc. 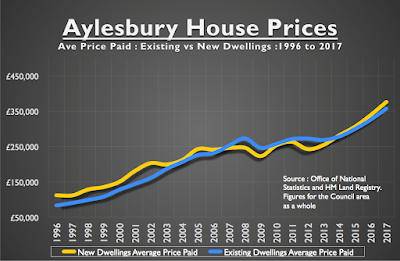 One would have to have a mirror image second-hand Aylesbury home and a duplicate new build right next door to each other, then calculate out which Aylesbury house buyers or Aylesbury buy to let landlords would pay more for? Perhaps if everything was the same (all things being equal), there might not be any difference in what buyers would be prepared to pay… but then again, it’s like new cars versus cars that have a few hundred miles on the clock ... there is always a difference on the forecourt … because things are never wholly equal. 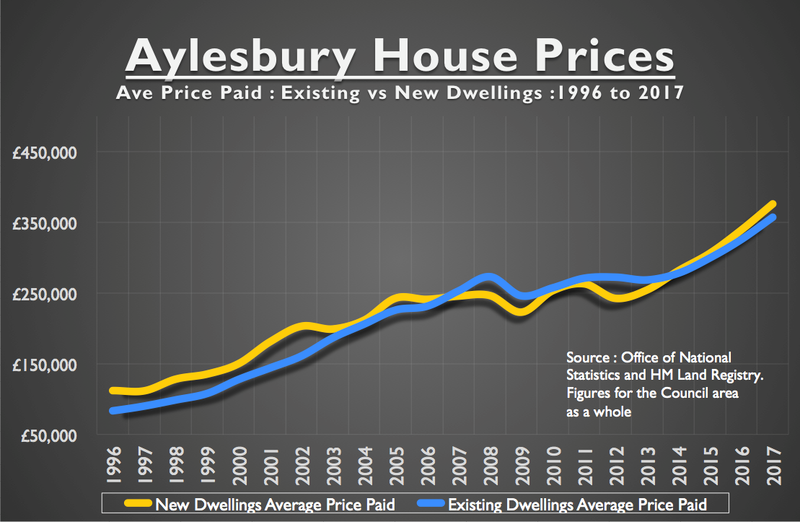 What I do know is that my statistics of the Aylesbury property market show that new build Aylesbury apartments are worth more to people than their second-hand equivalents, whilst the difference is negligible between new build Aylesbury detached houses and second-hand Aylesbury detached houses. However, I believe the really important lesson in all these statistics is the fact that ‘new build premium’ for new-build versus buying a second-hand property increases in a buoyant market and reduces in a tougher market. So, if you want to buy new and the only consideration is money … try buying in a tougher challenging property market. For those of you out there that want to achieve a better yield over capital growth, I have seen the below property online that you should give some consideration to. 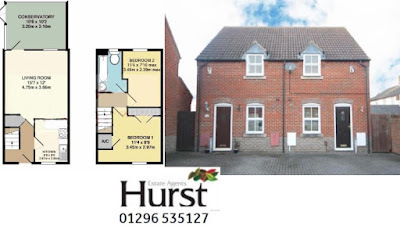 A tenanted, one bedroom house on the market for £180,000 with Hurst Estate Agents could be a ready made investment for either a new investor or someone looking to add something to their portfolio. Its presented well throughout, but you may want to look at replacing that bathroom at some point in the future. So if we work conservatively on this, and expect a rent of £695, that would give a yield of around 4.5% Gross. Which is good, considering in a more buoyant rental market properties like this can fetch £725pcm and sometimes beyond. You will need to do some digging to see what the current tenant is paying, but even if its lower, you don't have all the set up costs of finding a tenant (at least not straight away). Now the price, I have seen similar property types sell for around £174,000 in the last 8 months or so and my personal feeling is that the market hasn't exactly sky rocketed in that time, so you could even do a bit of work to secure the property at a little under the asking price. Just remember if you really want it, the seller is an investor too so they may be less inclined to negotiate too much. Anyway, if your in the market for a buy to let property, this could be a good one for you to consider. and let me know how you are getting on with your Buy to Let search! Aylesbury’s ‘Millennials’ set to inherit £453,757 each in property! My research shows there are 6,614 households in Aylesbury owned by Aylesbury Baby Boomers (born 1946 to 1964) and Aylesbury’s Silent Generation (born 1945 and before). It also shows there are 17,468 Generation X’s of Aylesbury (Aylesbury people born between 1965 to 1976). Looking at demographics, homeownership statistics and current life expectancy, around two-thirds of those Aylesbury 17,468 Generation X’s have parents and grandparents who own those 6,614 Aylesbury properties. … and they will profit from one of the biggest inheritance explosions of any post-war generation to the tune of £2.599bn of Aylesbury property or £223,029 each but they will have to wait until their early 60’s to get it! There are 11,761 Millennials in Aylesbury and my research shows around two thirds of them are set to inherit the 9,060 Aylesbury Generation X’s properties. Those Generation X’s Aylesbury homes are worth £3.560bn meaning, on average, each Millennial will inherit £453,757; but not until at least 2040 to 2060! While the Aylesbury Millennials have done far less well in amassing their own savings and assets, they are more likely to take advantage of an inheritance boom in the years to come. This will probably be very welcome news for those Aylesbury Millennials, including some from poorer upbringings who in the past would have been unlikely to receive gifts and legacies. However, inheritance is not the magic weapon that will get the Millennials on to the Aylesbury housing ladder or tackle growing wealth cracks in UK society, as the inheritance is unlikely to be made available when they are trying to buy their first home…but before all you Aylesbury Millennials start running up debts, over 50% of females and around 35% of men are going to have to pay for nursing home care. Interestingly, I read recently that a quarter of people who have to pay for their care, run out of money. So, if you are an Aylesbury Millennial there potentially will be nothing left for you. Of course, most parents want to give their children an inheritance, the consideration that what you have worked genuinely hard for over your working life won’t go to your children to help them through their lives is a really awful one … maybe that is why I am seeing a lot of Aylesbury grandparents doing something meaningful, and helping their grandchildren, the Millennials, with the deposit for their first house. One solution to the housing crisis in Aylesbury (and the UK as a whole) is if grandparents, where they are able to, help financially with the deposit for a house. Buying is cheaper than renting – we have proved it many times in these articles … so, it’s not a case of not affording the mortgage, the issue is raising the 5% to 10% mortgage deposit for these Millennials. Yes, I said ‘rentirement’, not retirement ... rentirement and it relates to the 606 (and growing) Aylesbury people, who don’t own their own Aylesbury home but rent their home, privately from a buy to let landlord and who are currently in their 50’s and early to mid-60’s. The truth is that these Aylesbury people are prospectively soon to retire with little more than their state pension of £155.95 per week, probably with a small private pension of a couple of hundred pounds a month, meaning the average Aylesbury retiree can expect to retire on about £200 a week once they retire at 67. The average rent in Aylesbury is £959 a month, so a lot of the retirement “income” will be taken up in rent, meaning the remainder will have to be paid for out their savings or the taxpayer will have to stump up the bill (and with life expectancy currently in the mid to late 80’s, that is quite a big bill … a total of £139,486,960 over the next 20 years to be paid from the tenant’s savings or the taxpayers coffers to be precise! You might say it’s not fair for Aylesbury tax payers to pick up the bill and that these mature Aylesbury renters should start saving thousands of pounds a year now to be able to afford their rent in retirement. However, in many circumstances, the reason these people are privately renting in the first place is that they were never able to find the money for a mortgage deposit on their home in the first place, or didn’t earn enough to qualify for a mortgage …and now as they approach retirement with hope of a nice council bungalow, that hope is diminishing because of the council house sell off in the 1980’s! For a change, the Aylesbury 30 to 40 somethings will be better off, as their parents are more likely to be homeowners and cascade their equity down the line when their parents pass away. For example, that is what is happening in Europe where renting is common, the majority of people rent in their 20’s, 30’s and 40’s, but by the time they hit 50’s and 60’s (and retirement), they will invest the money they have inherited from their parents passing away and buy their own home. So, what does this all mean for buy to let landlords in Aylesbury? Have you noticed how the new homes builders don’t build bungalows anymore ... in fact some said the ‘bungalow storey’ is over. The waning in the number of bungalows being built has more to do with supply than demand. The fact is that for new homes builders there is more money in constructing houses than there is in constructing bungalows. Bungalows are voracious when it comes to land they need as because bungalow has a larger footprint for the same amount of square meterage as a two/three storey house due to the fact they are on one level instead of two or three. That means, as demand will continue to rise for bungalows supply will remain the same. We all know what happens when demand outs strips supply … prices (i.e. rents) for bungalows will inevitably go up. 4% yield on Fairford leys? With 2018 firmly underway, I thought I would have a little look at the sales market to see if there is anything out there that had the potential to be a “good buy” for a buy to let investor. Well, this time I have two properties that have the potential to be a good investment. 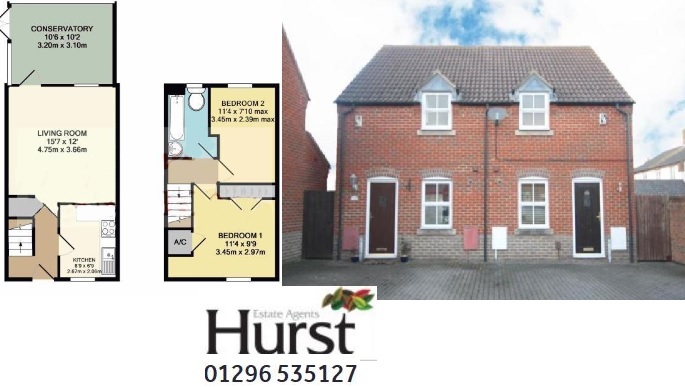 first is this Two Bedroom Semi on Fairford Leys, on the market with Hurst since 17th January 2018 and priced at £257,500, this property could be a ready made buy to let, its neutrally decorated throughout, the kitchen and bathrooms appear to be the originals but they are also in good tidy order and could see a few more years of use yet. Whilst it doesn’t have a garage, it does have parking and a conservatory for a little extra living space. Rental wise in a conservative market you could reasonably expect to hit £850 PCM. 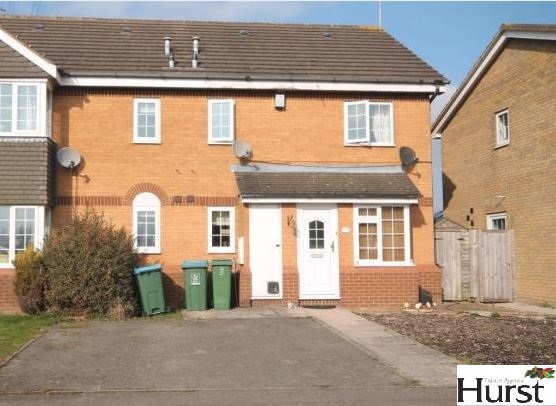 Next on the list is another two-bed semi on Fairford Leys, and is one I can’t quite fathom as to why it has not yet sold. On the market at “offers over” £250,000 this is a good example of a popular rental property in a popular area and from what I can see, a good price. This has been on the market with Connells for a while and reduced recently, but as with the above rental expectation in a conservative market would be £850 PCM. So, if the seller is motivated you could try and cut the stamp duty threshold a bit and aim for a gross yield of just over 4%. Whilst the yield on both of these properties is one thing, it’s the capital growth that could pay dividends in the long run on these properties. 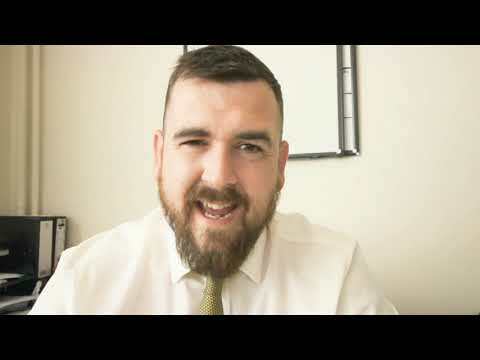 As I am sure you are aware, one the best things about my job as an agent is helping Aylesbury landlords with their strategic portfolio management. Gone are the days of making money by buying any old Aylesbury property to rent out or sell on. Nowadays, property investment is both an art and science. The art is your gut reaction to a property, but with the power of the internet and the way the Aylesbury property market has gone in the last 11 years, science must also play its part on a property’s future viability for investment. However, another metric I like to use is the average rent per square foot. The reason being is, that is a great way to judge a property from the point of view of the tenant ... what space they get for their money. Now of course, location has a huge influencing factor when it comes to rents (and hence rent per square foot). Like people buying a property, tenants also have that balancing act between better/worse location, more vs. less money and size of accommodation (bigger and more rooms equalling more money) and where they live (location) verses making ends meet. My research showed that doubling the size of any Aylesbury property doesn’t mean you will double the value of it … in either value or rent. This is because the marginal value increases diminish as the size of the property increases. In layman’s terms … Subject to a few assumptions, double the size of the house doesn’t mean double the value … what really happens is a doubling of the size gives only an approximately 40% to 65% uplift in value, but here comes the even more fascinating part … when it came to the rental figures, double the size of the house meant only 20% to 45% in increase in rent.